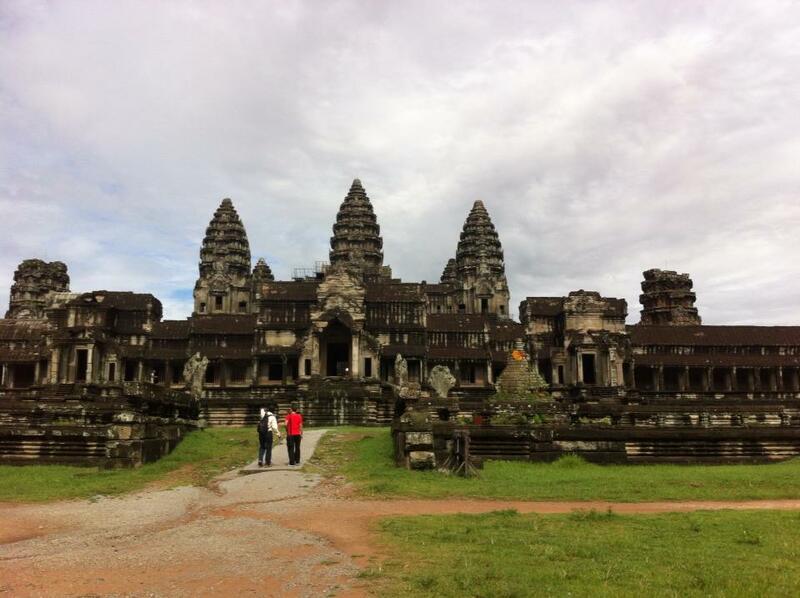 Guest blogger Anya Martin has just returned from a trip to Cambodia, where she explored the magnificent and now world-famous Angkor temple complex near Siem Reap. In this guest article, Anya not only shares what she’s learnt about the site’s construction and history but also discusses the impact the 2001 Tomb Raider film has had on the local economy. In the 2001 film Lara Croft: Tomb Raider, Lara pays a visit to a hidden tomb in Cambodia, where she finds the first half of a powerful relic known as the ‘Triangle of Light’. Though the inner sections of the tomb itself (with its somewhat aggressive statue guardians) are clearly a combination of studio and CGI, the area surrounding this ‘tomb’ was in fact filmed in the ancient city of Angkor, in north-east Cambodia. Angkor, meaning ‘Capital City’ in Khmer (the official language of Cambodia), was unsurprisingly the capital of the Khmer Empire. This empire, at the height of its power between the 9th and 15th centuries, covered much of the area of modern-day Cambodia, Laos, and Thailand, as well as parts of Vietnam and Burma (Myanmar). With elaborate hydraulic infrastructures spanning over an area of 1000 km² (390 sq mi), Angkor was by far the largest pre-industrial city in the world. For some perspective, New York City is 1,213 km², and London is 1,572 km² (both having populations of approximately 8.3 million) though, of course, this is not including the larger urban and metropolitan areas. It is unsure how large the population of Angkor was but some estimate it was as high as one million. Today, the city is entirely in ruins. After a slow decline over the 13th and 14th centuries, it was sacked by Ayutthayan invaders in the 15th century and abandoned, save the famed Angkor Wat, the largest and most impressive temple complex in the city, which remained an active Buddhist shrine. The construction of the site over several centuries means that there is an interesting variety of styles displayed across the site. Angkor Wat, originally a Hindu temple dedicated to Vishnu, is surrounded by a large moat. Inside, it contains a series of galleries which get higher and higher, with pleasant courtyard spaces in between (one of which may have been deliberately flooded to represent the ocean). The centre of the complex features five towers, the central one, thought to be the abode of the gods, containing a shrine and rising 65m above ground level. The original statues of Vishnu were removed and replaced with Buddha statues when the temple was converted. The entire complex is decorated with elaborate stone bas-reliefs which represent scenes from Hindu mythology. Unfortunately, excavations of the pits beneath the shrine in the 1930s revealed that it had long since been looted. Bayon, a temple in Angkor Thom (the central part of the ancient city), is known for the beautiful, serene faces carved in stone. These are thought to be either bodhisattvas (enlightened beings), or representations of King Jayavarman VII, who oversaw the building of the site. Ta Prohm, unlike the other temples, has been left in the same condition in which it was found. It is famed for the huge trees which have grown on top of the structures and draped their roots (very photogenically) over the galleries. This summer, I travelled to Cambodia and, of course, a key spot on my itinerary was Angkor. Unfortunately, my visit was limited to one day – not nearly enough time to explore such a large area – but it was a wonderful opportunity to see the grandeur of this ancient civilisation. And, though I can’t say I’m a huge fan of the movie, it was great fun feeling just like Lara while exploring the more secluded ruins, even if the monkeys were a bit intimidating. Now, considering that the Angkorian temples featured in Tomb Raider (which, for the record, are Ta Prohm, Bayon, and Angkor Thom) are not named as such or discussed for any of their historical interest, there’s not a lot that can be said about their representation in the film. And since I’d like to avoid this article devolving into lengthy descriptive passages and a dry enumeration of dates and names (if it hasn’t already), I thought I’d bring up another point of interest: the impact of the Tomb Raider film on the communities near Angkor and the nearby city Siem Reap. It might sound strange to think that one (poorly-rated) film could have any impact at all on such an important site but to understand, we have to look at the recent history of Cambodia. After the fall of Angkor, Cambodia was ruled by various neighbours until it was colonised by the French in the 19th century. It gained its independence in 1953, but after a period of political instability was seized in 1975 by the communist Khmer Rouge and its infamous leader, Pol Pot. The ensuing four-year period was plagued with famine, forced labour, political executions and widespread human rights abuses, which resulted in the deaths of approximately 2 million Cambodians (around 25% of the population). The Khmer Rouge wanted to return the country to a purely agrarian, pre-industrial state, and as part of this effort, attempted to exterminate everyone that it considered ‘bourgeois’. Anyone considered ‘intellectual’ was murdered: not only those who were educated, but also anyone who had worked in the film or music industries, and even people who simply wore glasses.The regime was eventually defeated by the Vietnamese, who occupied the country for the next decade. So where does Tomb Raider come in to this? Unsurprisingly, film production was completely halted during the Khmer Rouge’s reign due to the murder of the workers and the destruction of most of the country’s infrastructure. But the state of poverty and disorder lasted for long afterwards. Cambodia only began to recover in the 1990s and it is still one of the world’s poorest countries. In fact, Tomb Raider was the first film to be shot there since 1964, and was not without difficulties. Since there was little to no infrastructure whatsoever, most of the filming equipment (30 trucks worth) had to be brought in from Thailand. And this involved driving the long journey to Siem Reap along pothole- and landmine-ridden unpaved roads, with a convoy of soldiers ahead to repair bridges (for the record, this journey is still bumpy today, though not nearly so dangerous). In the making of the film, several hundred Cambodian people were employed as extras and crew, bringing in tens of thousands of dollars into the economy. Furthermore, Paramount Pictures paid in total $70,000 to the Cambodian authorities for the rights to film at Angkor, money that was put towards extensive conservation and renovation works at the temples. But that’s not it. Although tourism was already growing in Cambodia (and at Angkor specifically) before Tomb Raider was filmed, it was still not a particularly popular destination for travellers. But with the heavily-promoted 2001 release of the film, people across the world were suddenly exposed to this long-ignored site, and this likely had an important influence on tourism to the region. In fact, there was a larger than usual increase in tourism immediately afterwards (see this graph). Ta Prohm is now often nicknamed as the ‘Tomb Raider temple’ or the ‘Angelina Jolie temple’, and strolling around Siem Reap, you’ll see frequent references to the film, including the popular Tomb Raider cocktail – a mixture of Cointreau, soda and lime which was said to be the favoured drink of Ms Jolie. Since then, tourism to Cambodia and Angkor has continued to flourish, rapidly increasing year-on-year, and the country has seen substantial economic development, with tourism being a key industry. I learnt that the capital Phnom Penh had only seven paved roads in the 1990s. Today, it has several skyscrapers. Clearly, Tomb Raider’s influence is simply one of myriad factors and it would be naïve to claim that it had so huge an effect on the tourism industry. After all, it was growing before and long after the release of the film. But there’s no doubt that Lara Croft has made her mark on the local economy of Siem Reap and on the livelihoods of its inhabitants, and we can at least say that she has stoked the image of Angkor as the adventurer’s paradise that it is. If you have any comments or feedback on this article, you’re welcome to leave your comments below or contact Anya by email (anya.martin8_at_gmail_dot_com). You might also enjoy Anya’s other guest article Gates of Hel: The Norse Cosmology Behind Tomb Raider: Underworld, which looks at Norse mythology and its depiction in Tomb Raider: Underworld. Disclaimer: Angkor Wat and the surrounding temples have been targeted by looters over the years and have suffered damage as a result of mass tourism. The Archaeology of Tomb Raider and its guest bloggers do not condone the theft or sale of looted antiquities from the site and advise all visitors to Angkor to treat the monuments with respect. Which Tomb Raider Location Would You Love to Explore in Real Life? A guest contribution I wrote for my favourite blog, The Archaeology of Tomb Raider; check it out! I can’t wait to go there!